As I have noted before, body weight is a noisy thing. Day to day, your weight will probably fluctuate by several pounds. If you’re trying to lose weight, this noise can cause unfounded frustration and premature excitement. When I started a serious weight loss plan a year and a half ago, I bought a wifi-enabled Withings Scale. The scale allows me to automatically sync my weight with Montior Your Weight, MyFitnessPal, RunKeeper, and other fitness apps on my phone. IFTTT also has great Withings support allowing me to push my weight to various other web services. For a few months, I have been experimenting with using this time series to give myself a less-noisy update on my weight, and I’ve come up with a decent solution. OUTPUT_PATH <- "~/Dropbox/Text Notes/Weight Stats.txt"
I want this script to be run every time my weight is updated, so I created a second IFTTT rule that will create a new file in my Dropbox, called new_weight_measurement, every time I weigh in. On my Mac Mini, I have a Hazel rule to watch for a file of this name to be created. When Hazel sees the file, it runs my R script and deletes that file. At this point, every time I step on my scale, a text file with readable statistics about my smoothed weight appear in my Dropbox folder. Of course, I want this updated information to be pushed directly too me. Hazel is again the perfect tool for the job. 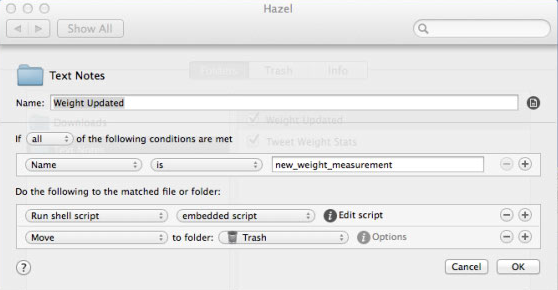 I have a second Hazel rule that watches for Weight Stats.txt to be created. 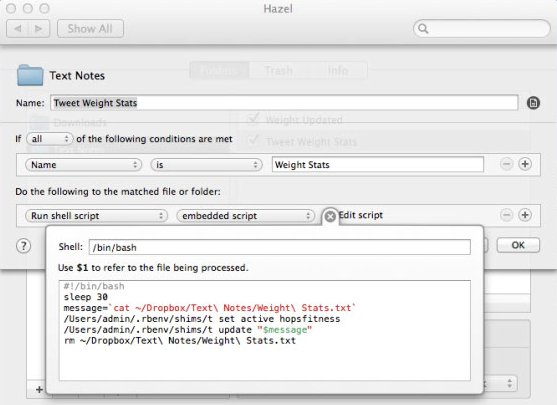 Hazel can pass the path of the updated file into any script of your choice. You could, for example, use Mailgun to email it to yourself or Pushover to push it to your mobile devices. Obviously, I want to tweet mine. Since this data goes to Twitter, I can get it painlessly pushed to my phone: Twitter still allows you subscribe to accounts via text message, which I’ve done with @hopsfitness. A minute or so after I step on my scale, I get a text with useful information about where I am and where I’m going; this is much preferable to the noisy weight I see on my scale. Update (2014-12-06): I replaced my R script with a Python/pandas script. It requires Python 3 (to render the delta characters).